Weathernews Releases 2016 Typhoon Season Outlook: Fewer Storms due to High SST in Indian Ocean and End of El Niño – Weathernews Inc.
Weathernews Inc. (Headquarters: Chiba City, Japan; CEO: Chihito Kusabiraki) has released a seasonal outlook for the 2016 western North Pacific Typhoon Season. Normally the first tropical storm has formed by May. However, one reason for the late start of the season is that the Sea Surface Temperature (SST) over the Indian Ocean is higher than normal, making the surface pressure over the waters east of the Philippines, where tropical cyclones often form, higher than average and suppressing convective activity in the region. The high SST in the Indian Ocean are forecast to continue, and the possibility for La Niña conditions to form over the equatorial Pacific Ocean is high. Past years in which Indian Ocean SST were high, and La Niña forms after an El Niño event dissipates have yielded fewer than normal tropical storms, and this year is expected to be similar. However, fewer storms does not mean that there will be less direct impact over Japan. In addition, if La Niña conditions develop, statistically speaking the tracks of tropical systems tend to be more westerly, causing higher risk of Vietnam and southern China to be directly affected. Precautions should be taken for such an eventuality this season. Weathernews continues to monitor and forecast the development of tropical storms that can bring major impact to human lives and property. Fig 1: Indian Ocean SST and Convection near the Philippines. 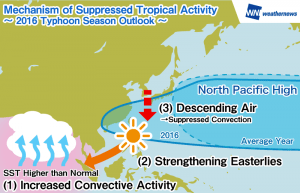 As of May 31, there have been no tropical storms in the western North Pacific. This will mark the first time since 1998 that the first named storm of the season forms in June or later. One reason for the dearth in tropical cyclones is the high SST in the Indian Ocean suppresses convection in the main area of tropical cyclogenesis. SST over the Indian Ocean are higher than average, causing active convection due to evaporation. (Fig 1, (1)). This causes the winds blowing into the Indian Ocean to increase, which strengthens easterly winds over the waters east of the Philippines (Fig 1, (2)). This causes a strengthening of the high pressure over the area east of the Philippines, which suppresses the convective activity required for tropical cyclone development (Fig 1, (3)). SST also play an important role in tropical storm formation, and the following is the Weathernews outlook. Past years with a similar climatological pattern have yielded less than average numbers of tropical storms, and this year is expected to also have less tropical storms than the average year. Ever since records began in 1951, there have been four seasons where El Niño dissipated in Spring/Summer and the SST over the Indian Ocean were high: 1983, 1992, 1998 and 2010. With the exception of 1992, the rest of the similar seasons had less than the annual average of about 26 tropical storms. In addition 1998 and 2010 also had a summertime La Niña event, and both seasons saw only about 60% of the average number of tropical storms, with 16 and 14 storms respectively (See Table 1). However, fewer storms does not mean that there will be less direct impacts over eastern and southeastern Asia. If La Niña conditions develop, statistically speaking the tracks of tropical systems tend to be more westerly, causing higher risk of Vietnam and southern China to be directly affected. There also remains the chance for some of the storms to recurve toward Japan as well. Precautions should be taken for such an eventuality this season. This figure is used basis Creative Commons CC BY-NC-ND 4.0 license terms. *Here,“Average”is the average of the four seasons outlined. Decimal places after the first are rounded.